Our whole reason for going to Calgary was to watch my brother Stefan speed-skate. He has been skating now for a really long time, probably about 15 years. After he finished high school he packed up his life and moved to Calgary, where he would be able to train full-time. I still can't believe that he trains for hours at a time, every day of the week, almost every day of the year. One of my New Years Resolutions was to go to the gym 3 times per week, which means that I actually go less than that! I definitely have no where near the dedication and determination that he has. So, we were off to Calgary to watch the All-Round Continental Qualifiers. I find all of the different meets that he skates in very confusing, but basically this meet would (could) qualify him to go to the All-Round World Championships in Russia. 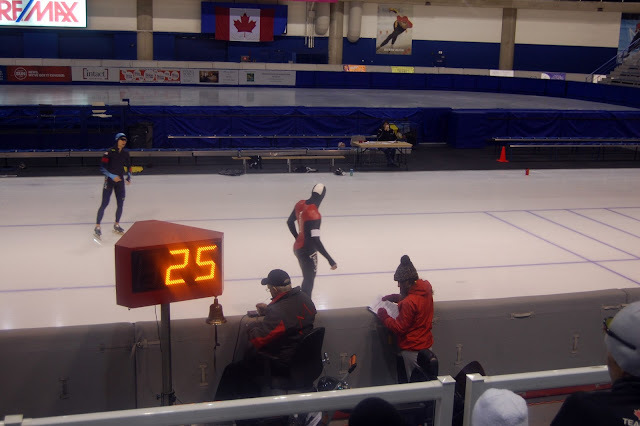 This particular meet was gruelling - every skater had to race all four distances in only two days. On Saturday night the skaters would race the 500 metres and the 5000 metres, and then on Sunday night they would race the 1500 metres and the 10,000 metres. There were 14 skaters competing in the competition, and the top 8 would qualify for the World's in Russia. We planned on getting to the Oval around 6pm on Saturday, even though the races didn't begin until 7:30. 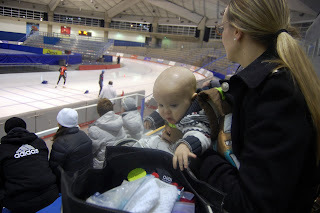 With a baby, taking the train, and navigating our way through Calgary we wanted to allow ourselves plenty of time to get there, take a seat, and relax before the races started. Good thing we gave ourselves the extra time!! We got to the Oval around 6:20, and the races had already started! Stefan's first race was coming up in only about 10 minutes!! Apparently the start time had been changed, but Speed Skate Canada neglected to update their website. Soren did watch some races! Stefan's first race went well - he placed 6th in the 500m which was great for him. Soren actually enjoyed watching! He was watching the skaters intently, you could see his eyes tracking them as they skated by. He was even waving his arms and 'cheering' (or more like shrieking). It was pretty cute. The next race, the 5000m, didn't go as well as Stefan wanted it to. He ended up in 8th which was ok, but his time was off from what he was hoping for. For Day 2 of the races we arrived in plenty of time for the 6pm start, and took our seats. The first race was the 1500, and unfortunately Stefan didn't skate as well as he would have liked. He placed a disappointing 10th, which he thought virtually put him out of the running to wind up in the Top 8 (those who would qualify for Russia). We settled in to watch the 10,000m race, which was the final one of the competition. Now, watching men skate 10 KILOMETRES in 13 or 14 minutes is very impressive, but I must admit it is not my favourite race to watch. The skaters skate in pairs, so it takes about 15 minutes for each pair to skate. They skate a total of 25 laps, in what looks to me like the exact same position. Somehow, some of the skaters are so consistent that they post identical lap times for multiple laps in a row. i.e. 32.67 seconds, 32.67 seconds, 32.64 seconds, etc. It AMAZES me that an athlete could be so precise as to cover a distance of 400 metres in the exact same amount of time, down to the hundredth of a second. (Stefan pointed out that this is their full-time job... but still.) Stefan skated well, but still thought Russia was out of the question for him. We chatted with him after the race, sitting with him as he stretched and cooled down. There were 3 pairs of skaters after him, but we were kind of done with watching. We were focused on more important things, like trying to think of a baby-friendly restaurant that would be open at 10pm on a Sunday night! The races finally ended, and Stefan's coach came around to find him. We couldn't believe it when he said 'Well, looks like you're going to Russia!' Another skater had raced a poor race, and as a result Stefan had overtook him in the overall points category. The final totals were up, Stefan was in 8th place, and he was going to Russia!! Congratulations Stefan! 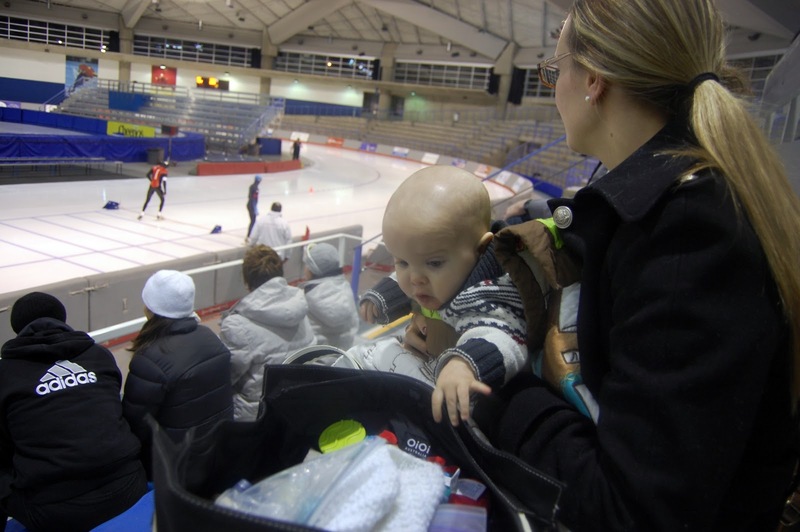 We had a fun week-end watching you skate, and it turned out just the way you had hoped! We will be cheering (from afar) when you compete in Russia for the All-Round Championship!